Guillermo Del Toro’s Crimson Peak sees the director return to the horror genre with the story of a woman haunted by the ghosts inhabiting an old run down house. It’s been a while since Del Toro played around with horror. I’m not counting his TV Show The Strain or the sadly cancelled Silent Hills video game. In terms of films it has been a while since he directed a horror film. His flair for visuals and talent for creating creepy imagery lends itself perfectly to crafting these sorts of films. On the surface this film has a great set-up. It has a Gothic Victorian setting, a great cast and a protagonist who has an open minded vivid imagination so there’s a lot to play with here. Early on in the film the central character Edith (Mia Wasikowska) in her capacity as an aspiring author points out that her novel is a story with ghosts in it but isn’t actaully a ghost story. This statement proves to be prophetic for the rest of the film as it plays out in much the same way. Edith is an interesting character to follow. She is intelligent, imaginative but also painfully naive due to a relatively sheltered upbringing by her father Carter (Jim Beaver). She is a prime target for the charms of English gentleman Thomas Sharpe (Tom Hiddleston) who immediately sets his sights on her and wins her over with his charming personality. Wasikowska does a great job playing this character. She radiates class and intelligence as well as projecting a sense of ignorance as to the way the works with and a tendency to take people at face value. She plays Edith as well spoken and calm but clearly has a lot of inner strength that serves her well as things in her life start to get strange. Hiddleston is a master of playing likeably sinister characters and Thomas is a perfect example of this. He is polite and charming publicly but in private there is a tortured darkness to him. There always seems to be something behind his convincingly fake smile and his words are loaded with subtext. Hiddleston is a joy to watch in this film and has fantastic chemistry with every one of the cast. Thomas’ sister Lucille (Jessica Chastain) is similarly incredible. There’s no pretense about her and no attempt to hide the fact that she is an incredibly unsettling person to be around. Her relationship with her brother is clearly an unhealthy one and whenever she interacts with Edith it is clear that Edith needs to be away from her immediately. Chastain impressively runs the gamut between being soft spoken and sinister to completely insane sometimes transitioning at a moments notice but never goes to the point of being camp. She’s the sort of character who makes your skin crawl when you watch her which is precisely the intention I think. Visually the film is stunning with the colour red turning up everywhere and always signifying a bad omen. The dilapidated house provides a classic horror setting and is incredibly well constructed. It’s sinking into the clay, the walls are falling apart, there’s a hole in the roof and plenty of creepy noises like creaks or wind effects keep the place seeming unsettling. There’s always a sense of tension as Edith wanders the cramped, dimly lit corridors chasing strange noises and shadowy figures. The ghosts look great as well and aren’t featured too heavily which makes their appearances more effective. Too many jump scares without any pay-off would have lessened the impact but Del Toro uses the less is more approach when featuring the ghosts. They all compliment the recurrence of the colour red to connect them to the bad omens associated with that colour. Unfortunately the ghosts don’t add much to the story beyond a startling visual identity. Their use in the narrative does help Edith answer some questions but she was well on her way to discovering them on her own so I don’t think the film would have been adversely affected had the ghosts not been there at all. The story is well told and compelling but it takes far too long to progress with several repeated ideas bogging down the running time. The first act set in America setting up Edith moving to England with Thomas goes on for too long without actually being all that important to the story. The uneven pacing really affects the unsettling mood being created. I liked the supporting characters such as Charlie Hunnam’s Doctor Alan McMichael who comes across as charming and has a lot of integrity. Hunnam’s performance at times feels a little bit forced and he looks sort of out of place in the period setting but his character was solid when he appeared and Hunnam does a good enough job of playing him. Jim Beaver as Edith’s father Carter is excellent. I’ve always thought Jim Beaver is a great character actor but I’ve been a fan of Supernatural since it started. It’s good to see him given a chance to act in a film like this as he inhabits his character perfectly. There is so much authority to his performance as well as a softness when it comes to interacting with his daughter. He comes across as a man who has worked his way up to a position of success and when he warns people against Thomas’ charming personality they feel compelled to listen. In terms of engagement, your mileage will vary on this one depending how much you enjoy stories set in Victorian times. The gothic horror isn’t central enough to recommend it based on its strengths as a ghost story as it is more of a drama that happens to have ghosts in it. If period set character drama is something you enjoy then I would give this my recommendation. If horror is what you crave then I’d suggest checking out some of Del Toro’s other work such as Pan’s Labyrinth or The Devil’s Backbone. A well crafted yet oddly placed Victorian drama that just so happens to have ghosts in it. 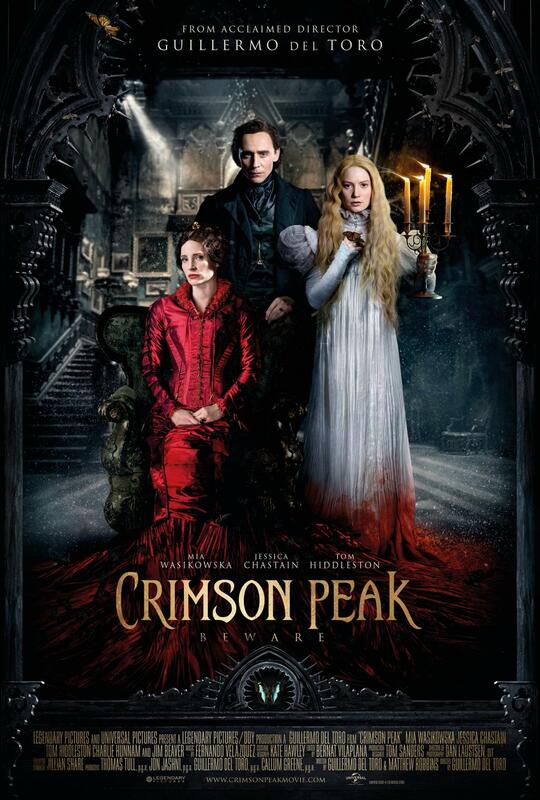 The film has a great set-up with a Gothic Victorian setting, a great cast and an open minded protagonist with a vivid imagination making it easier to sell the premise. Edith is a great central character with a believable and deep performance from Mia Wasikowska who portrays her as intelligent, strong but also very naive due to a sheltered upbringing. Her naivety makes her a prime candidate for the charms of Tom Hiddleston’s Thomas. Hiddleston is excellent in the role portraying Thomas as outwardly polite but with a sinister edge beneath the surface. He comes across as believably charming with something sinister behind his words and fake smile. Jessica Chastain is far more obviously up to something but thanks to her performance it never creeps into the realm of camp. She is the sort of character who makes your skin crawl and the relationship she has with her brother is clearly unhealthy. Chastain fully commits to the lunacy of the character and as such it is a memorable addition. Visually the film look stunning with the colour red always showing up to signify a dark omen. This feeds into the ghosts who are also coloured red and look appropriately terrifying. The house that the central characters spend most of the film in is appropriately unsettling with crumbling walls, unidentifiable sounds, a hole in the roof and constant darkness to have shadowy figures move around in. It’s the perfect place to create a sense of tension. One criticism that can be lobbied at the film is that the ghosts don’t contribute much beyond the visual leading me to wonder if the story would have really been affected had they not been featured at all. The pacing of the film is a little slow with several repeated ideas bogging down the running time in ways that could have been avoided. Overall it is well told and compelling but the film takes far too long to get going. The first act before Edith moves to England could have been trimmed significantly. Jim Beaver and Charlie Hunnam give impressive performances but aren’t featured too heavily. In particular I would have liked to see Jim Beaver’s character in the film for a while longer as he is a great character actor and seeing more of him work would have been most welcomed. Your mileage will vary on this depending on how much you enjoy Victorian drama stories. The horror elements are somewhat in the background so it isn’t the best example of Guillermo Del Toro’s command of the horror genre. It is definitely worth a look if you don’t mind any of that.